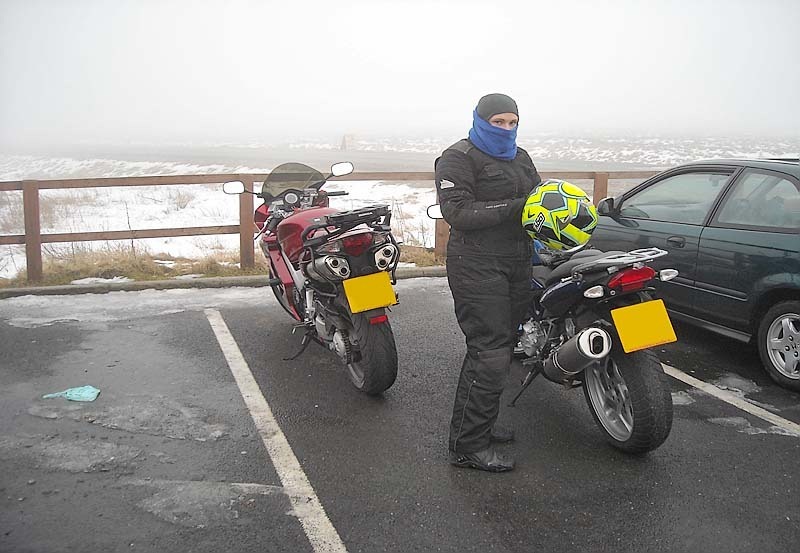 Myself and Helen went out for a ride today, mainly to get my new rubber scrubbed in for the NUKB ride to the Lakes tomorrow. 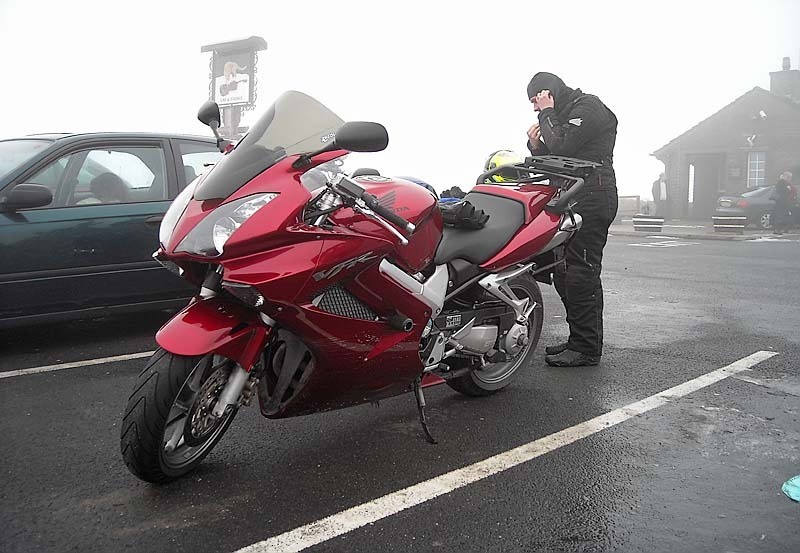 We set out at about 11:00am and decided to head over to Buxton and the Cat & Fiddle for a change from the Dales. We filled up at are local petrol station then proceeded down the M62 to Milnrow getting off at junction 22 and heading into Denshaw. At Denshaw we turned left and went up the A640, when we got to the next crossroads the lights were flashing to say that the A640 to Huddersfield was closed. We weren’t going that way but I was expecting that other roads would be shut and we wouldn’t be able to get to Buxton the way I had planned. Anyway we carried on regardless and took the A6052 to Delph and then the A669 to Greenfield, we then dropped on the lower road and took the A635 over Saddleworth Moor to Holmfirth. Now I was expecting this road to be closed but it wasn’t, but there was snow everywhere but the road, which was lined with snow banks. Unfortunately there was nowhere safe to stop to take a nice photo. 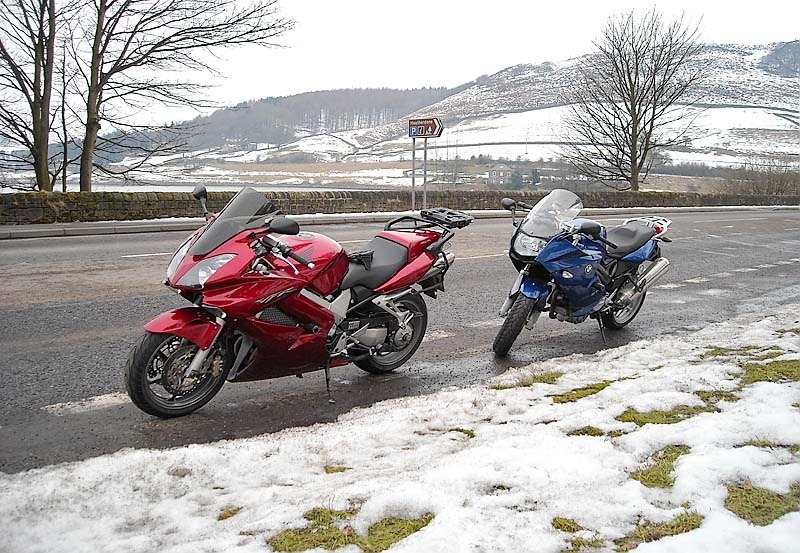 In Holmfirth we turned right and took the A6024 over Heyden Moor via the A628 and B6105 to Glossop. In Glossop we stopped at a cafe for a brew and toilet break. 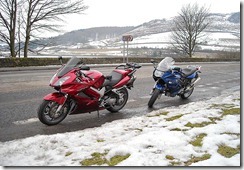 After a brief rest we took the A57 over Snake Pass to Ladybower Reservoir. We stopped at the toilets at Ladybower but didn’t risk going into the carpark as it looked dodgy. After this brief stop we continued down the A6013 then turned right on to the A6187 to Castleton. Before we got to Castleton we turned left on to B6049 and then proceed through Bradwell and Tideswell. When we got to the end of the road we turned right on to the A6 for Buxton. In Buxton we followed the signs for the A537 to Macclesfield and eventually fought through the traffic and started the ascent of the Cat & Fiddle. We soon hit the fog/mist and it was difficult to see, constant visor wiping. Just managed to make out the Cat & Fiddle to stop for lunch. After Ham sandwiches and Coffee we proceed down the other side of the Cat & Fiddle toward Macclesfield. We turned right towards the bottom of the road, down the B5470 through Rainow to Chapel-en-le-Firth. We then took the A624 back towards Glossop. We didn’t go through Glossop as I know a sneaky back way through Charlesworth and Broadbottom, that brings you out at the M67 roundabout. We then proceeded via the motorway network back home to Heywood.